Dr. Andrew Jones, as many of you know, is one of my favorite on line vets. I try to follow his blog postings when I can, because they are truly remarkable in the valuable information he gives away. Â I think you’ll appreciate this CPR posting as much as I do. 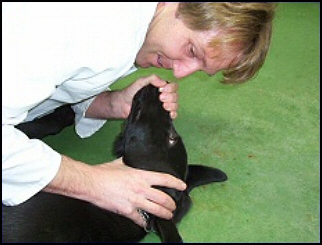 Cardiopulmonary Resuscitation is the most important first aid technique that every pet owner should be comfortable with. Chances are that you will never have to use it, but it will save your pet’s life if a ball is lodged in his airway. This section describes the basic technique. 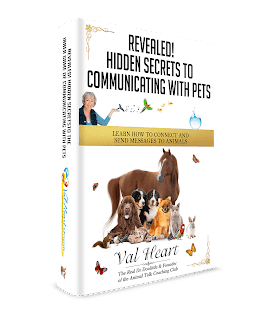 This is also covered in my pet first aid manual, Pet First Aid Secrets: Complete Canine And Feline First Aid Manual, but it is included here because of its importance. For a demonstration and more thorough description, refer to my video: Pet CPR. The first step is making sure that your pet is truly unresponsive. 1) CHECK his breathing by placing your hand in front of his mouth and nose. 2) CHECK for his heartbeat by placing your ear against the left side of his chest “ this is the area where his left elbow touches his chest, immediately behind his left armpit. The second step in CPR is obtaining a patent airway. 1) PULL the tongue out of your pet’s mouth, but be careful to not get bitten. 2) STRAIGHTEN the neck by moving the head to be in line with the neck. DO NOT HYPEREXTEND IN CASES OF NECK TRAUMA. 3) PERFORM two rescue breaths, by closing the mouth and performing mouth to nose ventilations. IF they continue, then proceed to STEP 3, BREATHING. If there are no breaths, then look into the mouth. 4) VISIBLY inspect the mouth and look down the throat for a foreign body. If you see something, reach into the airway and remove it. 5) IF the airway is still not open, attempt HEIMLICH (shown in following steps). 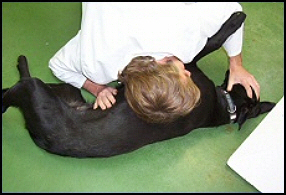 6) TURN your pet upside down, with back against your chest. 7) WITH both arms, give sharp thrusts to the abdomen. 8) AFTER 5 thrusts, stop and check to see if the object is visible in the airway. If so remove it and give 2 mouth-to-nose rescue breaths. If the breaths do not go in, repeat HEIMLICH. After achieving a patent airway, perform RESCUE BREATHING. 1) CLOSE your pet’s mouth and breathe directly into his nose until his chest expands. If the chest does not expand then go back to STEP 2 AIRWAY. 2) VENTILATE at 15 breaths per minute. One BREATH every 4 seconds. 1) ENSURE there are no major points of bleeding. Control as necessary. 2) GENTLY lay your pet on his right side. 3) LOCATE the heart, which is found on the lower half of the chest on the left side, behind the elbow of the front left leg. Place one hand below the heart to support the chest; place the other hand over the heart. 4) COMPRESS the chest 15 times followed by 2 rescue breaths. 3 compressions every 2 seconds. Compress the chest 1/2 inch for small pets and 1 1/2 inches for large pets. 5)EVERY 15 times follow up with 2 rescue breaths. Continue heart massage compressions and the rescue breathing until you hear a heartbeat and feel regular breathing. 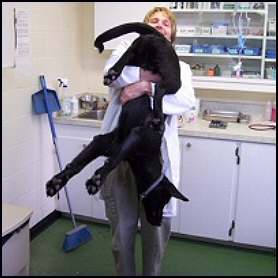 Once your pet is breathing and his heart is beating, call your veterinarian immediately. For a printable version of this article just click here to email us your request.